Another frozen fruity recipe coming your way today. 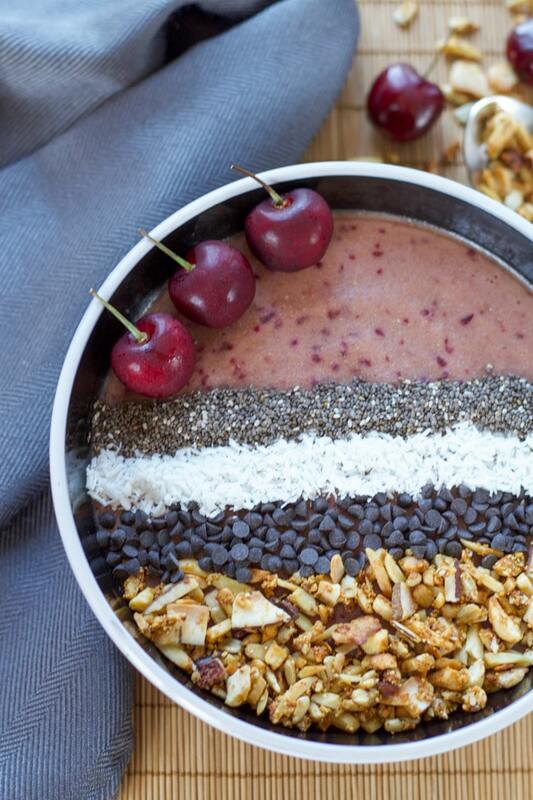 This time, it’s in the form of a breakfast smoothie bowl. 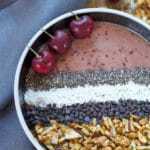 This Coconut Banana Cherry Chip Smoothie Bowl is creamy and delicious with lots of coconut, granola and dark chocolate chips. It’s clean eating, grain-free and perfect for warm summer mornings! We are finally enjoying warm summer days here in Newfoundland. Woohoo! That means more time outside enjoying the sunshine, and less time inside my warm kitchen! It also means I need more no-bake recipes in my life 😉 . Not too long ago, I posted this recipe for Frozen Blackberry Goat Cheese Chocolate Bombs and promised that there would be other no-bake fruit recipes to follow. Since cherries are still in season, I thought I would share this smoothie bowl recipe, which I’ve been eating a lot lately 🙂 . My usual breakfast consists of eggs, peanut butter and chia jam toast, or a protein pancake. But every now and then I like to change it up with a smoothie. But not just a drinkable smoothie, which, I’m not going to lie, doesn’t feel like a meal to me. I like a substantial smoothie….in a bowl and loaded with toppings that I need to eat with a spoon! As you may remember from some of my other recipes, like this Peach Praline Ice Cream, I use full fat coconut milk in a lot of my recipes (the cans, not the cartons). To be more precise, I use it to make coconut cream. The problem is that the cream only requires the solidified coconut milk on top of the can. For a while, I was just throwing out the leftover coconut water in the bottom of the can. I hated wasting it, so I started adding the coconut water to smoothies and smoothie bowls in place of almond milk. 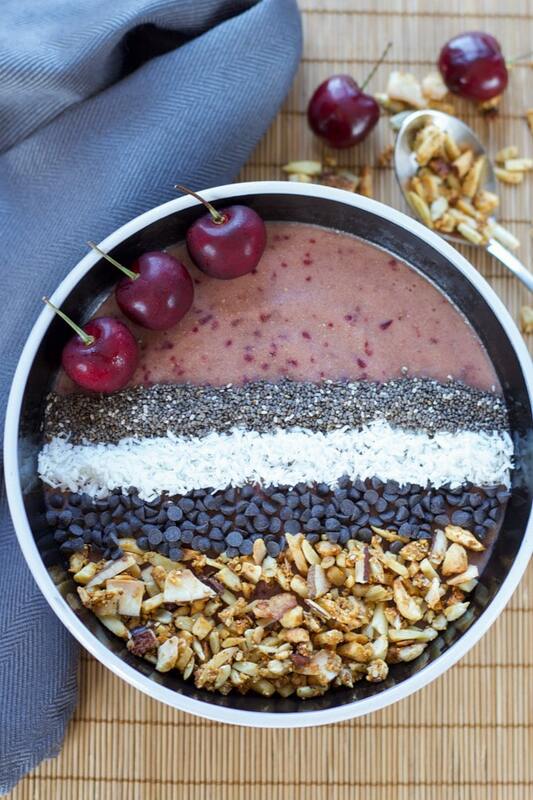 This Coconut Banana Cherry Chip Smoothie Bowl is quick and easy to blend together. You just need frozen bananas and pitted cherries. Add them to a blender with coconut water and flax meal, blend until smooth, and done! Stir in some dark mini chocolate chips and pour into a bowl. Top with your favourite toppings. For this recipe, I used flaked coconut, chia seeds, chocolate chips, cherries, and homemade grain-free granola. This granola is just a nut and seed based concoction I make to top my yogurt, muffins and smoothies. It’s great if your stomach can’t always handle oat-based granola. While you can make this Coconut Banana Cherry Chip Smoothie Bowl in the morning and enjoy it right away, sometimes I double the recipe and freeze it in two separate glass containers for a quick breakfast. All you need to do is defrost in the microwave for 90 seconds or so, give it a stir and then add toppings. This is great for mornings where your short on time or just don’t want to turn the blender on and wake up your family! Warm summer mornings call for cold and refreshing smoothie bowls. This Coconut Banana Cherry Chip Smoothie Bowl has a coconut cherry flavour with a hint of banana and chocolate. Loaded with fruit, flax meal, chia, nuts and seeds, this bowl has your morning fix of fibre, protein and omega-3 fatty acids. Add the frozen cherries, banana, coconut water and flax meal to a blender and blend on high until mixture is smooth. Stir in 1 tsp of chocolate chips. 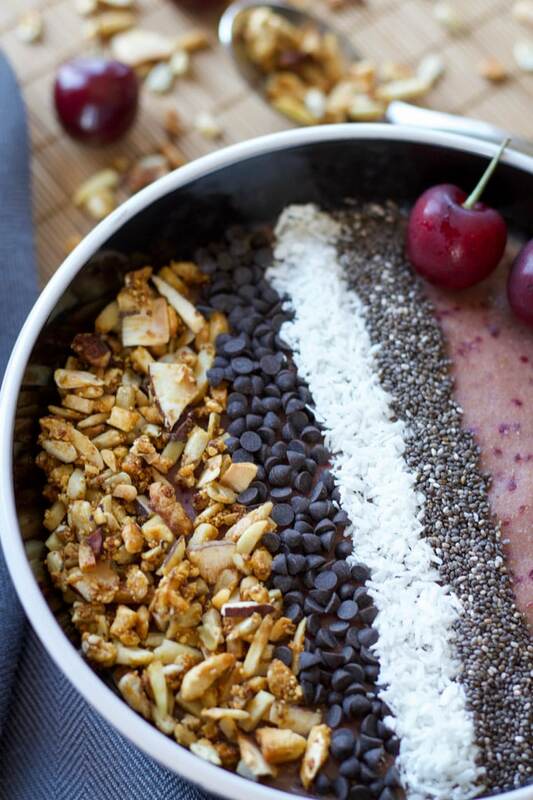 Pour into bowl and top with granola, chia seeds, coconut, additional chocolate chips and cherries. Pre-heat oven to 350 degrees. Combine all the ingredients in a large bowl and mix together. Spread out on a parchment paper lined baking sheet. Bake for 10 minutes, stirring at the midway point. Don’t worry if the granola seems a bit soft when you remove it from the oven. It will get crunchy as it cools on the baking sheet. If you prefer your granola less chunky, blend the coconut chips, almonds and cashews in the blender or food processor first. Be sure not to over blend. A few pulses should do the trick!